By esiegel on April 27, 2009. For over 100 million years, dinosaurs, and not mammals, were the dominant form of life on Earth. The pinnacle of evolution at the time, dinosaurs filled the niches of being the largest, most differentiated animals -- herbivores and carnivores both -- on the planet. As you well know from seeing their fossils, they would dwarf their modern, mammalian counterparts if they were still alive today. But they're not still alive today, because a mass extinction event occurred 65 million years ago. And the fossil record indicates that it occurred all at once, which is unusual. The Earth was overrun with dinosaurs, everywhere. In just a few hundred thousand years, they were all gone. All of them. Large, small, it doesn't matter. That's what extinct means -- every last one. But one of the best science questions ever -- and this is always true -- is how? How did the dinosaurs, and many, many other forms of life, all become extinct at once? When we look at rocks, we find that one type -- sedimentary rock, forms from deposits. These deposits make it relatively easy to date the rock, or to figure out when the rocks (and hence the fossilized organisms inside) were deposited there. 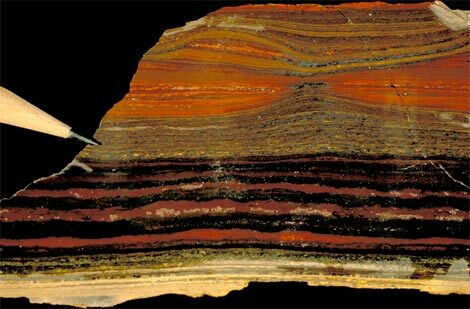 Here's what sedimentary rock looks like. 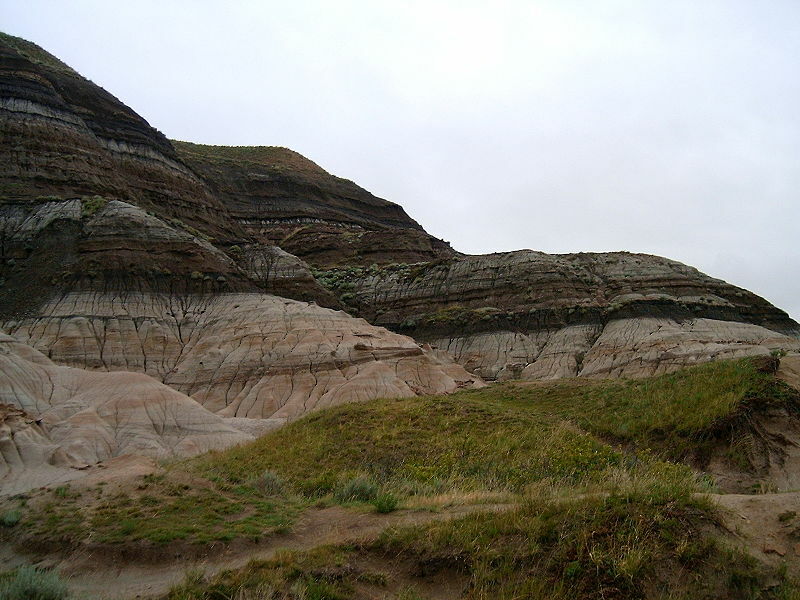 Well, there's a layer of rock, known as the K-T boundary, that seems to have a plethora of dinosaur fossils below the boundary, but almost none above the boundary. What's very interesting is that we find this exact same boundary all over the world, dating to 65 million years ago, with dinosaurs found abundantly below it, with the few ones found above it thought to be geologically reworked (upturned and reburied). This thin layer of ash -- the boundary between light and dark in the above picture -- is the split between when dinosaurs are found and when they aren't. What's amazing about this is that this tiny, thin film of a layer contains something in great abundance that the Earth doesn't have much of at all: the element iridium. Naturally, the Earth has so little iridium that it's inconceivable that this iridium could have come from Earth. Where could it have come from? Leave a thin-layer deposit of minerals not necessarily found on Earth. Well, guess what we observe? A huge extinction in photosynthetic organisms on land everywhere and even in the oceans. What else? The practically immediate extinction of nearly all non-avian dinosaurs and all animals over a certain size. What else? Geological evidence of tsunamis, flooding, and ashy deposits. And what else? That layer of iridium-rich ash found all over the Earth. Seems like all we need is a crater the right size that's 65 million years old, and that will be our "smoking gun" for this theory. You mean it's right there? Off the Yucatan peninsula? A basin the right size and shape, with clear evidence of being an impact crater, and dated to right around 65 million years ago? Yup. There it is. 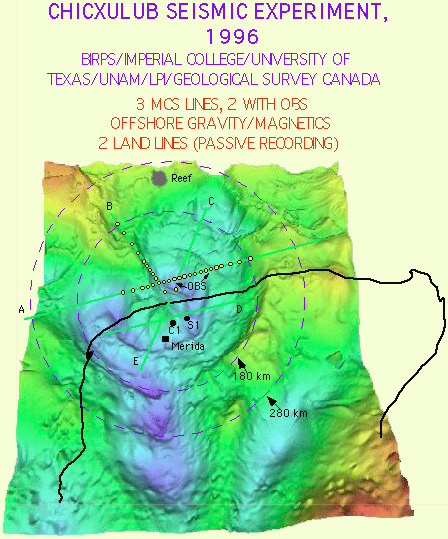 We call it Chicxulub Crater, and it fits the bill completely. Right off the coast to cause tsunamis, and the sinkholes we find today around the crater's rim match up exactly with what we expect. But this has been known for years; why write about it now? This is topical because of a story by my buddy Ian, writer for AstroEngine.com and Universe Today, where he reports on a naysayer who doesn't believe this story. It's true that there are a few unexplained mysteries about this theory, such as how uniform the K-T layer actually is (i.e., how much sedimentation/overturning there was), whether the Chicxulub impact is the one that actually created it, and whether a few hundred-thousand years is a reasonable settling time for the debris. But the evidence here is really overwhelming and the explanation is very, very simple and compelling. That, and a consensus of scientific experts disagree with her conclusions, and support the view presented here. Much like with global climate change, evolution, dark matter, gravity and the big bang, there are unexplained details here. However, these theories -- overall -- are solid, sound, valid, and by far the best scientific, natural explanations available. So don't be fooled by the skeptics who say that because one detail is unexplained, the whole theory is wrong. That's part of how we learn from science, is by properly explaining these details. Could many of these theories be superseded someday? Absolutely. 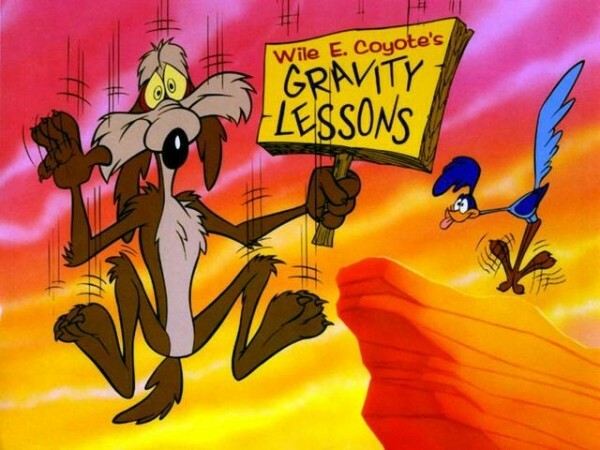 But you walk off the cliff if you want; I'll choose to "believe" in gravity. Extinction of the Old, Evolution of the New: What really happened to the dinosaurs? Great post! But I take exception to the use of the word "skeptic" -- "So don't be fooled by the skeptics who say that because one detail is unexplained, the whole theory is wrong." I wouldn't call that person a skeptic. A skeptic uses reason, considers the facts and weighs the evidence to come to a LOGICAL conclusion. (Logical is the key word, here.) Somebody who blows off an entire established scientific theory because of just one unanswered question would be more aptly described as a "conspiracy theorist", "pseudoscientist", "sheep", or even a "cynic" if you want to be nice about it. You could also call them "gullible", "misinformed", or "easily swayed". But "skeptic".... That's just too generous! The inevitable caveat to this fine blogpost is that not all dinosaurs died, since the birds are dinosaurs. I really don't insist that people call birds dinosaurs, of course, or want to say that claiming birds evolved from dinosaurs is wrong--in the vernacular. In that sense, one may say that all of the dinosaurs went extinct. 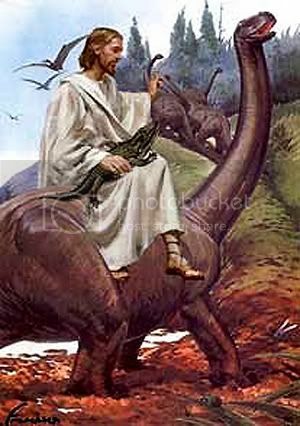 It's in scientific language that one does not say that the dinosaurs all went extinct, because there such a claim typically means that they left no descendents. The point being that in cladistics one typically considers birds to be dinosaurs because they will always be the descendents of dinosaurs. To be sure, we don't usually use the same rules by calling mammals reptiles. Nonetheless, the safe way to say that "the dinosaurs went extinct" is to say, "non-avian dinosaurs" all went extinct. One suspects that few birds made it over the threshold as well, yet we're generally happy that they did. Don't let this bit detract from the value of the blogpost, for it is a good didactic piece. "What else? The practically immediate extinction of nearly all non-avian dinosaurs and all animals over a certain size." While no one doubts that there was a major impact around the time of the C/T boundary, that little 100,000 year uncertainty you mentioned makes it a good hypothesis, but not a slam dunk case. OK, Dave. I read it (quickly), but didn't pick up on that bit. I did notice the "all of them" earlier, but missed the "non-avian dinosaurs" further down . So never mind all that. I think 'naysayer' is a harsh word to be using here. She appears to be a tenured professor at a very respectable university with a long list of published papers and book(s)on this subject area. I would just call it a different hypothesis. There seems to be no doubt that some significant event caused the extinction. It matters little to me whether it was this huge rock or a volcano or something else around this time. Maybe because I am not a betting man and have no money on the outcome. Too bad you refuted all of this pseudoscientific nonsense yourself, apparently without even realizing it! Your first picture clearly proves that humans and dinosaurs lived at the same time. However you want to define dinosaur, I say that since you delineate between avian and terrestrial dinosaurs, technically they didn't go extinct but had their offshoot offspring in birds survive. Severe calamity has stressed that only the medium and the small bioforms adapt and survive major changes, while the big and bulky work best in placid times. And what about the Deccan Traps? Personally I think the impact was one half of a double whammy that caused a massive interruption in normal conditions. Common sense is poorly defined but you know when you don't see it. Two words, Jesus Horse. BUT as the saying goes "The devil lies in the details". I think this theory should be chalanged often, not because I desagree with it (I'm with Andy Cooper in this one), but all theories should be chalanged, especially those we are too confortable with. 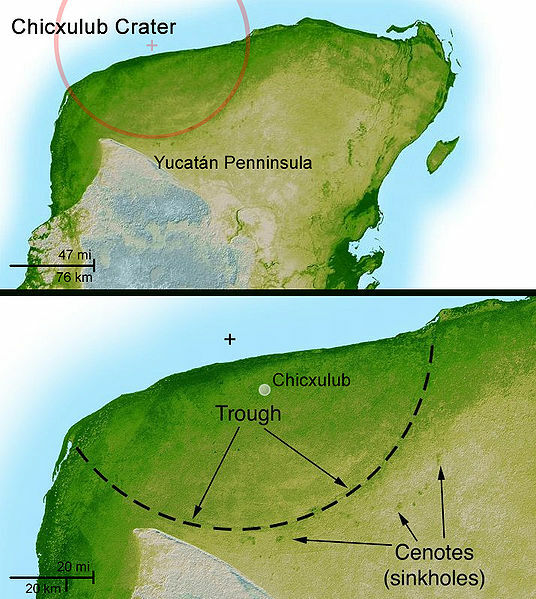 We know that there is a crater in the YucatÃ¡n, we know that most dinosaurs went extinct, we know that these events occured about the same time. Presto asteroid killed the dinosaurs, ok, now let's beat the crap out of this theory see if it stands. If it does it will end up beating the crap of everyboy who challanged it. Just like de Niro in Cape Fear. That's what I like in science, no reverence for "truth". There are undoubtedly lots of "interesting" things that happened around 65 Myr ago. The giant impact? Totally. Increased volcanic activity? That's true, although everyone *except* Keller et al. dates those at 68 Myr ago, not 65 Myr. This was definitely a stressed, changing environment here on Earth, but the overwhelming consensus is that the giant impact was the... well, not quite straw... deathblow, perhaps, that broke the camel's tyrannosaur's back. Is Iridium more common in asteroids than here on Earth (and if so, why? ), or is the high abundance in this specific rock just a coÃ¯ncidence? Commenter avondale on UT makes a very compelling case that for all her credentials, prof Keller has a history of being a contrarian, and much like the AGW deniers who want to introduce alternative explanations without bothering to show what's wrong with the scientific concensus, this researcher has fallen in love with her hypothesis and doesn't bother to explain why the impact didn't kill the dinos. Iridium is more common in at least some asteroids than on Earth, but we don't really know why the elements segregated themselves the way they did. The Sun? 99% hydrogen and helium. The Earth? Mostly iron, nickel, silicon and oxygen. Mercury? More dense elements than Earth. Saturn? Far less dense than Jupiter. So we don't really know all that well. Avondale at UT is actually active in this field, and has credentials that far surpass mine, and I like his comment a lot. Link here for those who are interested. I should be pointed out that several avian type dinosaurs also went extinct. For instance, the Troodons, which appear to have had feathers also went extinct 65 million years ago. It should be pointed out that paleontologist Robert Bakker has also disputed the impact theory. He has claimed that disease germs are the culprit. Don't forget the best part of the impact theory: the entire sky turning into an oven set on "broil" for several hours. "So don't be fooled by the skeptics who say that because one detail is unexplained, the whole theory is wrong." Sometimes a few little unexplained details do lead to the overthrow of a widely accepted theory. The perihelion of mercury, the spectrum of blackbody radiation, even the K-T layer itself - pre 1980, come to mind. Many widely accepted theories do turn out to be wrong (or should I say "unacceptable"?). God and the Devil are both in the details. Nobody said science is easy, so be tolerant of skeptics. 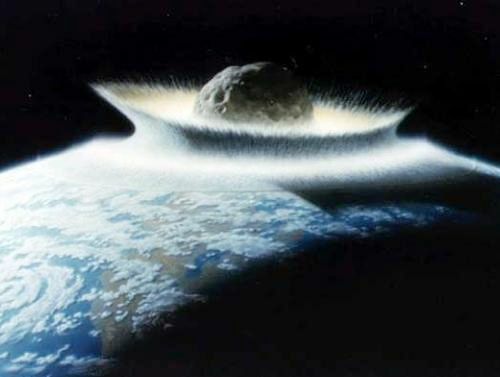 Professor Keller is correct when she states that the bolide impact caused no extinctions. However, she is not correct when she attributes the extinctions to the Deccan Traps volcanism. 1. The maximum size of the dinosaurs were gradually becoming smaller; mammals were becoming larger. 3. The massive volcanic activity during the times of the dinosaurs, flood basalt type, initiated at the core-mantle boundary. And, the intensity of this type of volcanism has steadily decreased since 65mya. 4. The continents, merged together to form Pangea, had broken apart and were dispersing. The wikipedia article on iridium says that because it is so dense and siderophilic (loves combining with iron), most of Earth's iridium gravitated to the core of the planet, leaving little in the crust, which explains why it is such a good marker for certain meteorites. I suppose Keller et al. could be labeled 'naysayers' but it seems to me that your last paragraph mentioning global warming, evolution, etc. implies they are similar types of contrarians. What parts of their analyses/conclusions lead you to such a comparison? I'm not saying their work is solid (I question it myself on the post Lab Lemming links to), but I'm just curious from your perspective. - There is good research done by Keller's group, pointing out geological inconsistencies with the K-T layer being the definitive boundary of extinction. - The data and results that she and her group presents are fairly solid, although they are not completely explicable. - Her conclusions are extraordinarily suspect, and run contrary to the broad consensus of geophysicists. As far as I know, the geological community falls into three camps on this issue, Keller and her coauthors, a few other fringe scientists, and everyone else. Keller reminds me of Halton Arp, a great astrophysicist who's made great contributions to astronomy, who points to one or two small details that haven't been ironed out in a grand, complicated theory (the big bang), and then declares that the whole theory is untenable. As scientists, we ought to be smarter than that. A nice, simple and concise article. A good starting point for a follow-up could be to go into detail about the layer of ash of "a few hundred thousand years" and "mass extinction all at once", as you write. What were the mechanics of this sudden yet (I know, sudden in geological terms) drawn out period? The other starting point could be the iridium contained in that layer. Would an asteroid contain enough to show up in the layer around the world. How did it spread, how evenly (ie. more concentrated around said impact crater, or not? ), and above all, is the estimate of the total amount (surely it has been calculated?) enough to form an asteroid of the mass required to make the right size crater? There is no doubt an asteroid could be pure Iridium, but it would have to be "the size calculated from the impact data" or larger (not pure Iridium) to qualify. Agree? IÂ´m sorry. But i donÂ´t believe this. In my opinion they were wiped out by a climatic changing. Actually Chris, that's what both theories kinda boil down to. The question is the trigger for the "climatic" change. 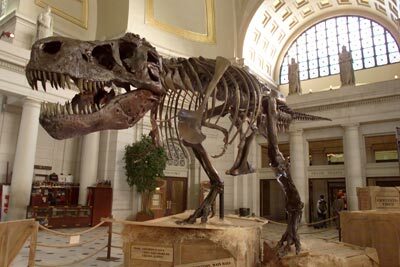 hi,first of what dose (URL) mean and also get more pics of dinosaur skeletons. "Her conclusions are extraordinarily suspect, and run contrary to the broad consensus of geophysicists." It may be useful for a journalist to make the statement above, but within the sandbox of science, everyone should acknowledge that the breadth of consensus means nothing. All you need to prove this is to weigh the consensus for any great truth just before it was discovered, announced and broadly acknowledged. Every scientist who can think of a new way to arrange the facts available into a more compact, efficient or predictive simulation of reality, deserves to be rewarded with our attention and considered a productive member of the community regardless of whether or not his/her views ultimately prevail. The real pleasure of science is enhanced if we engage these issues as if consensus has absolutely nothing to do with the primary issue at stake: is something true, or not? In this type of process, the second person to recognize the truth has nearly as much fun as the first. Jan Smit and Gerta Keller have been going at this for a long time now. I hope that they remain the best of friends and thereby present science as the role model for the type of politics that may one day save us all. God bless Gerta and Jan.
i think the dinosaurs croaked cause they felt like it. "As far as I know, the geological community falls into three camps on this issue, Keller and her coauthors, a few other fringe scientists, and everyone else. Keller reminds me of Halton Arp, a great astrophysicist who's made great contributions to astronomy, who points to one or two small details that haven't been ironed out in a grand, complicated theory (the big bang), and then declares that the whole theory is untenable." Sounds more like religion to me. Nah, It is not about meteor that killed all dinosaurs. Ice age animals wiped out, too. Nobody knows it. "If we continue with current farming practices, vast amounts of wilderness will be lost, millions of birds and billions of insects will die, scarce water will be wasted, greenhouse gas emissions will increase and farm workers will be exposed to harmful chemicals. Clearly testking PW0-104, the future of our planet requires that we improve the environmental, economic and social impacts of our global farming systems-- the three essential pillars of sustainable agriculture. Genetically engineered crops will continue to play an important role in this future." This is very off topic but since there seems to be so many highly educated individuals posting here I was hoping I could get a response to a question I have. If there was a supposed meteor capable of destroying most life on Earth 65 million years ago(roughly), why did it not and why does it not happen more frequently? Each congregational committee will be involved in some way in the exploration of environmental concerns. Some of the ideas being considered include discussion/study groups devoted to the study of Biblical, rabbinic, modern Zionist and contemporary literature on the subject, having the Religious School students fashion grow wheat and barley for the Omer period as well as developing an Omer calendar they could sell to benefit environmental causes. Other ideas on the table include: study of oil/energy issues at Hannukah, using Passover to examine our enslavement to material goods and consumerism. By Shavuot the goal is to have worked out rules of eco-kashrut and an ethical purchasing guide for the congregation with suggestions for personal use. Other options include inviting a major speaker to the congregation sometime during the year and possibly a weekend retreat devoted to environmental issues. We hope to have the rabbi and other service leaders make creative use of the year's theme while leading services. Yeah, but that book is load of crap. So find the real one first, eh? I'm sure the scientists are happy with their new extinction theory but, it has a few holes in it that need to be addressed. 1: there was an E.L.E. level impact about 100 million years prior to the Yucatan one and it did not wipe out the dinosaurs. 2: If the Yucatan impact destroyed almost all the plant life due to nuclear winter and caused all the plant eating dinosaurs to die thus bringing about the death of the carnivores(even all the small dinosaurs died according to this theory) why would plant eating mammals live through it? They should have died as well bringing about the death of the carnivorous mammals. This is only two of the problems with this theory. THAT WAS A GREAT BLOG I LOVED IT I THINK YOU SHOULD WRITE MORE SCIENTIFIC BLOGS! what if the earth changed position when the rock hit it and the dinos couldnt handle the cold climate change but the were in cave so they lived.